Redwoods are in the news this week, reminding the world once again that Earth’s tallest trees are truly ecosystems in their own right. Teeming with life from quite literally their roots to their highest leaves, the magnificent coast redwoods are home to hundreds of other species. With the pioneering redwood canopy research that began in the 1990s with Professor Stephen Sillett at Humboldt State University, we continue to learn and understand more about the lichens, mosses, ferns, and wildlife that reside hundreds of feet off the ground every year. New discoveries about the diversity of life in the redwood canopy are made possible due to the scientists who carefully ascend into the forest canopy to meticulously catalogue the array species that need our protection along with the coast redwoods trees themselves. As the recent NYT article (external link) describes, Save the Redwoods League sponsored Dr. Rikke Reese Næsborg to help California State Parks better understand the lichen community in redwoods of Armstrong Woods SNR, Big Basin Redwoods SP, and Pfeiffer Big Sur SP. This collaboration started at Muir Woods National Monument in 2014, when Dr. Næsborg collaborated with a team of redwood canopy biologists to document the lichen of Cathedral Grove’s canopy. Next time you hike among the redwoods, look for fallen redwood branches and notice the spectacular variety of lichens that cling to bark. Lichens come in all shapes and sizes and who knows, maybe you’ll discover a species we haven’t yet found! It’s National Park Week in the National Park System’s 100th anniversary year, so there’s no better time for Sally Jewell, US Secretary of the Interior, to inspire and challenge the nation, calling for a major course correction in the way we conserve America’s public lands, waters and wildlife. Long before the environmental movement started, Save the Redwoods League began its work to protect redwood forests as part of the early conservation movement. 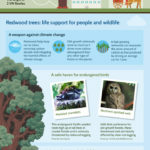 But like most habitats around the world, the redwood forests continue to need our support. The coast redwoods and giant sequoias, the tallest and largest trees in the world, and the diverse plants and animals that inhabit their forests need all of us to be their voice. Just read The Wild Trees book. Plug this book (again?) on this site, please. Inspiring.